This is my first blog in the June holidays. I am thrilled as I came back from my vacation in Sunny Greece. We went to Athens, Santorini and Naxos. It was a good trip, we planned it all ourselves, free & easy and managed to see one of the loveliest and beautiful, postcard worthy islands in the world. Santorini should be one of the places you must go before you die. As it was in early June, Summer has just started not long. But the weather was HOT, we came back three shades darker (tan). Fruits were aplenty on the roadside stalls and the cherries and strawberries were calling out to me. As you know, cherries in Singapore are SO very expensive. It can go up to S$16 to S$20 a kilogram here in our supermarkets. The roadside stalls in Athens were selling them for like 4 Euros (S$6.80) a kilogram. We were eating it for snacks every other day. But when we got to the Central Market in Monastiraki, Athens, they were selling it for 1 Euro per kilogram!!! What? S$1.70 for a whole kilogram? That is ridiculous I thought. Singapore is over charging us for everything! I made a plan to go to the market on the day we fly off just to get some cherries to bring home. So true enough, we flew home with 3 whole kilograms of fresh cherries, very happy and satisfied. Other cheap items to buy are saffron and olive oil of course. Fresh cherries are delicate and on transit, even hand carried, there will be some slightly bruised ones that will not be exactly very pretty to look at but completely edible. What do I do with those bruised ones? Make jam of course! Who would buy cherries from our supermarkets to make your own jam in Singapore? Come on, you and I will never. But in this case, cherries came dirt cheap and I would take the opportunity to make a fresh cherry jam. Further more, I could either use the Thermomix machine or bread machine to make the jam without stirring. 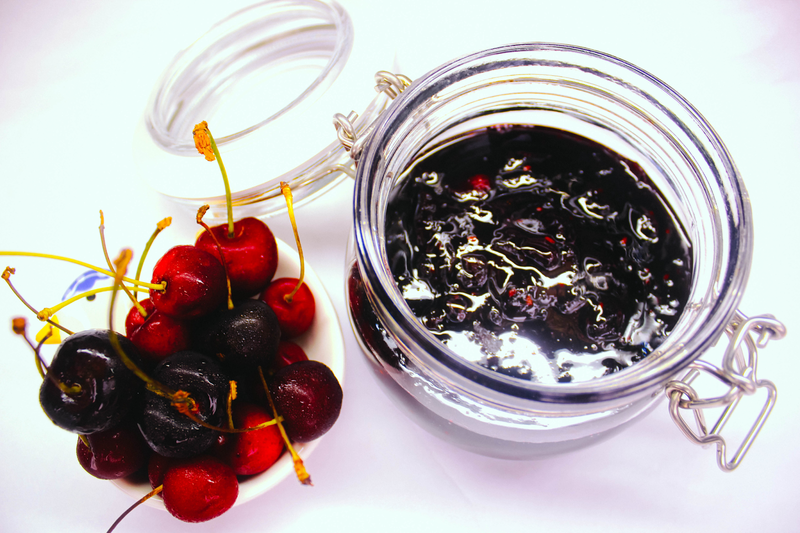 Very simple and the end result is a nice, delicious Mason jar of GREEK cherry jam ! Wash, remove the stalks and pits of the cherries, drain the water and pat dry. Put cherries, sugar, zest and lemon juice in a non-metallic bowl and mix everything together. Let it macerate for 1 hour in the fridge. In a small or medium pot, bring the mixture to a simmer over medium heat. Stir the mixture now and then. Test for sweetness, if you want it sweeter, add a few tsp of sugar. You can test by putting a small saucer in the freezer, make sure it is completely chilled and drop a teaspoonful of jam onto the cold plate and put it back into the freezer for 2 minutes. If the jam wrinkles, it means it is set, if not, cook for another 5 minutes. Make sure you turn off the fire when you are testing, if not your whole pot might burn. Store the cooled jam in a sterilised jar. Take note that I never use pectin to make my homemade jam. Be it Strawberry. blueberry or kumquat jam. Put all the ingredients and cook for 45 to 60 minutes at 100C, speed 1, with the Thermomix basket on the mixing bowl lid instead of the cup to allow steam to escape. The last 5 to 10 minutes, I like to turn the heat to Varoma, speed 2. Put all the ingredients in the baking pan, press the JAM key. It will take about 1 hour 20 min in my Zojirushi Home Baker Mini. Enjoy with any kind of bread, homemade is the best of course! This is one of the many orange trees in the middle of Syntagma Square, Athens, right in the middle of the city, opposite the Parliament House.